A tiny freshwater polyp called the hydra has a rather neat trick: It can't die. These polyps are able to accomplish this remarkable feat of apparent immorality by reproducing through budding rather than mating. But as geneticists from Kiel University in Germany recently discovered, the same longevity gene that makes the hydra immortal may also explain why humans get older — an important bit of insight that could eventually result in advanced therapies to treat human aging. 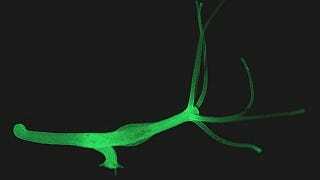 The study, which was published this week the Proceedings of the National Academy of Sciences, looked into the biological processes used by the hydra to avoid the effects of aging. The researchers discovered that each polyp contains stem cells capable of continuous reproduction and proliferation. Without this endless supply of regenerating stem cells, the polyp wouldn't be able to continually bud in the way that it does. We humans, it's important to note, also produce stem cells that help with cellular rejuvenation. But unfortunately, these stem cells lose their ability to proliferate and form fresh cells as we get older — what typically manifests as a dramatic decrease in muscle mass and other biological degradations. When studying the hydra, the Kiel research team managed to isolate one particular gene that plays a role in all of this — what's called FoxO. The isolation of this gene, what can be found in both polyps and other animals (including humans), came as a welcome surprise to the researchers. They then suspected a potential link to stem cell production, and by virtue, the aging process — or in the case of the hydra, its ability to avoid it. Further research into several genetically modified polyps (i.e. by suppressing different versions of the FoxO gene) did in fact reveal a connection to stem cell proliferation. Hydra with normal functioning FoxO exploited the indefinite self-renewal capacity of stem cells, but those without it or with impaired FoxO possessed significantly fewer stem cells. And in fact, the changes they saw in morphology were similar to what is typically seen in elderly humans. Fascinatingly, heightened FoxO activity has indeed been found in centenarians — people who have lived beyond 100 years. This offered the researchers a valuable piece of insight into the particulars of human aging, suggesting that there is a direct link and that it plays an important role in determining the length of lifespans. It's important to note that this conclusion is purely observational and conjectural; to prove this hypothesis, the researchers would have to perform similar genetic manipulations on humans. But that said, the researchers plan on moving ahead with further studies into the hydra and their amazing FoxO genes. And given the promising connection between the FoxO gene and the indefinite self-renewal of stem cells, it's not unreasonable to suggest that future biotechnologies may tap into this longevity gene to make it a crucial part of an advanced rejuvenation therapy.